Should we read the Peter Robinson books in order? 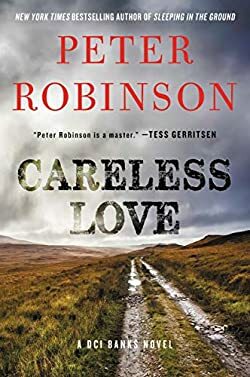 The Peter Robinson books in order are mostly about the popular Inspector Banks series, which currently includes 26 books with the latest one published in 2019 titled Careless Love. Peter Robinsons was born in Armley, Leeds, in England in 1950. He grew up in Yorkshire, where his Inspector Banks series is also set. After getting his BA in English Literature at the University of Leeds, in 1974 he moved to Canada, where he got his master’s degree in English and Creative writing from the University of Windsor. Next, he moved back to the UK but couldn’t find a job teaching, so he went back to Canada and got a Ph.D. in English at York University in Toronto. It was much easier to find jobs in Canada, so the author would go back and forth between the two countries until he would eventually fully settle down in Canada. Before writing his Banks series, he wrote poems and published his own work. When, during one summer, he went back to Yorkshire, he found his father reading a Raymond Chandler book. Next, he picked up many different British crime books by various authors, and he was hooked. He started writing as well, but the first three books were duds. Then he wrote A Dedicated Man (a book which became book #2 in the Inspector Banks series) and soon Penguin in Canada picked it up, along with the rest of the series. Peter started writing his DCI Banks books series in 1987, and so far he has currently 24 books written, with a latest one published in 2017 with the title Sleeping in the Ground. So who is DCI Banks? The Peter Robinson books have at center DCI inspector Alan Banks, an over-30-year-veteran policeman who moved to the fictional town of Eastvale near Yorkshire, after getting tired of the big city life, having been an inspector at the Metropolitan Police in London before. Some of the books in the series have been adapted to a TV show that started in 2010, The Inspector Banks cast features Stephen Thompkinson in the main role. While Peter Robinson is best known for his Inspector Banks series, he has also written a few other works non-related to it. One of the books that I enjoyed reading by him was a standalone novel (published in 2011) with the title Before the Poison. The way Inspector Banks was born was through Peter Robinson reading many crime novels set in England in the 1980s with detectives working cases at the police station. Thus, he figured that a new crime mystery series set in Yorkshire, the place where he grew up, would be enjoyable to British crime mystery readers. When he started the DCI Banks, the author was already living in Canada, however, he was still nostalgic for the UK of his past. He also knew his home country much better than his new uprooted country back then. Several of the books in the series take their plots from real life crimes that were reported in newspapers but which are incomplete in their storylines. The author takes the stories and through his creativity, takes the plots to new interesting directions. In an interview, Peter Robinson mentioned that in order to write successful crime mystery novels, you need to have a morbid imagination which leaves no space for squeamishness. Besides writing his Inspector Banks series and standalone novels, he is also teaching crime writing at the University of Toronto’s School of Continuing Studies. Several of his Inspector Banks novels have won awards, including the Anthony Award, the Arthur Ellis Award, the TORGI Talking Book Award, the Macavity Award for Best Short Story, the Barry Award, the Swedish Martin Beck Award, Spoken Word Bronze Award, CWA (UK) Dagger in The Library Award, and have been nominated for the Agatha Award. The book In a Dry Season has been a New York TimesNotable Book. The author currently lives in Toronto with his wife. Often, it is easy to forget that the author is now Canadian, and not British. His books are often likened to those of Ian Rankin and other similar British crime mystery writers, and with good reasons. Nobody ever likens him to Canadian authors. Here are the Peter Robinson Inspector Banks books in order of publication (along with the chronological order of each book released). The series is set in the fictional English town called Eastvale. Each story in the Inspector Banks series is separate from the rest, however as usual with crime and mystery series, to get the most out of the character development, it is best to read each book in publication order. This is incidentally also the chronological order, except for the two short story publications. It should be started with Gallows View, working your way up to Children of the Revolution, and then Abattoir Blues when the latest book got released in the bookstores. While Peter Robinson is best known for his DCI Banks series, the author has also written additional standalone novels. Here they are listed in order of publication. I just finished “In a dry season” and thought it was the first. Now I find it wasn’t. it is where he meets Annie. I’ve seen many of the TV series and it doesn’t seem to be the Banks in the “dry season”. Should I go to the beginning ? I read one of his DCI Banks novels that starts in Yorkshire but then Banks travels to Toronto On to follow a lead. I can not remember the name of this particular novel. Would anyone advise me of it’s title? I thoroughly enjoy these novels and wish to read this particular one again. deskinner5. I to love Peter Robinsons books and I am working my way through them. I quite like the TV series and think some of you are being a bit hard on the TV production. For those of you living in the USA, a few books are available from your public library service as kindle books and perhaps as physical books too. If you live in Australia, most (about twenty) are available as E-Pub books to read on your tablet. If you live in England, one of England’s best authors is only available as audio book and then there are only FOUR. Life’s tough if you are English looking for English authors in the English library! I saw the TV series here in the States before I began to read the books. I can see the actors who play DCI Banks (Stephen Tompkinson) and Annie (Andrea Lowe) perfectly in my mind as I read the books. Robinson’s talent is just short of awesome….almost in a league with james lee Burke….each have provided many days and and nights of extraordinary pleasure. Just watched the final episode of series 5. Annie gets stabbed. Does this happen in any of the books? I am from the states and love the tv series and the characters that portray them. Just started reading the books and am having trouble with the character descriptions. But I do love the books. They are very different from one another. I am hooked on British crime series. Much better than the states. As a long time reader/observer of Alan Banks, I feel that he has paid his dues. He has repented of all and everything. Now, as retirement rears, could he please find a woman companions/lover? Preferably a woman a bit softer than he has seen before. Where does Close to Home fit into the order of Banks’ novels? I have just finished, I thought, The Hanging Valley but it ends at page 316 with the word “working-” and goes no further. I would love to read the last few pages to find out the outcome of the investigation. Recently discovered Peter Robinson’s books………now obtained them all and on book number four ! Can’t put them down…….Years ago read every Agatha Christie book, but Robinson’s ‘Banks’ leaves them in the shade. A brilliant writer and I can see why so many people rate them so high. In a nutshell: fantastic mystery writer; every book. The TV series, at least that seen in USA is HORRIBLE. It is totally miscast and disrespects Robinson’s character’s development and plots. Please take the show off the air. Peter Robinson deserves far better to represent his talents. Really really really – the whole series is spoilt for me by the sad – but somehow predictable- spectacle of a late middle-aged man with a succession of much younger women .Young enough to be his daughter . It just makes me feel hugely uncomfortable – and sadly it makes me classify Banks in the ” loser” category . Get a grip and grow up man You look like a fool ! Would someone explain me why TV adaptation has so different plot than books? I understand some requirements of TV series – plot should be shorter and less complicated, but why so different sometimes? Additionally, TV adaptation is concentrated on criminal part of novels, while all social and cultural background like Banks’s music fascination has been completely ignored. serves me right for just looking at author and not book contents , live and learn lol! When can we expect the next DCI novel? I have two books that I cannot place . SKELETON HILL and THE SECRET HANGMAN. Can someone tell me where they fit in? Both books are by Peter Lovesey as part of the Peter Diamond series. I also am enjoying the DCI Banks books. I was wondering, in the older books there is a map of the area where the stories take place. It would be nice to have a map in the later books to follow along. Is there anyway to get a copy? I have read all of Peter Robinsons’s books and enjoy them because I live in West Yorkshire and he mentions a lot of places of where I have been and live etc., I don’t watch the episodes on tv as the actor is not right for the part. When you have a picture in your mind of DCI banks and he is supposed to be not very tall, dark hair and lean features, I saw a photo of Ian Rankin and thought that is how DCI banks should look!! He has written a novella called Summer Rain this year but I cannot find it anywhere. I have become an Alan Banks addict. While each novel depicts a different crime, we get from consulting experts insights related to the nature to that crime. Banks tenacity & capacity to assemble minimal information to reveal clues is awesome. The complex and sensitive character of Banks alone is memorable. Robinson’s literary style is excellent, from depth of emotion, relationships, humor, very quotable, to character development. He respects the reader. Thank you, Mr. Robinson, even though you keep me up all night reading. Just got “final Account” (audiobook version) and couldn’t find it here, seems it’s the U.S. Title of “Dry Bones That Dream”. I think that here in Australia we should have the British version! Couldn’t wait for Abattoir Blues to come out but finished it so fast….now having withdrawal symptoms. Love Peter Robinson’s writing of DCI Banks but agree with those who think the TV adaptation left much to be desired. Casting mistakes for DCI Banks and Annie…..does the author get any input into these programs I wonder? Who better to decide who should portray a character he has written about for years or at the very least give his opinion on. am i the only one wondering about DCI Banks’ education? Maybe this is something to do with British educational semantics or of the times. In earlier books (at least in Weds’s Child & Final Account) Banks regrets that he does not have a formal education. In a more recent book, ie Children of the Revolution, he mentions his time in college at London Polytechnic. Would this NOT be considered a formal education? Or in British verbiage, a formal education only means going to Oxford, Cambridge or a similar institution? Also, Polys in the 70s/80s may be different from current ones. It’s clear that the protagonist has evolved over time, so maybe this is one of those evolutions. Where does Blood at the Root come in the order of things? Why is there no mention of this book I. Your order of books? Blood at the Root is Dead Right, book #9 in the series. I can’t always keep track of every new title that any given book is renamed at. A newer printing changed the title from Dead Right to Blood at the Root. It is now mentioned in the listing as well. Are there any plans for another book this year? Am re-reading all in correct order this time. Make much more sense! Love the books but can’t get into TV series. He is SO wrong for Alan Banks – character and height!! Not sure if I am remembering correctly, but our first glimpse of Lucy is when as a small child she is kept in a cage along with other children at a quasi double house somewhere —–what is the name of that book ???? Lastly she turns-up murdered herself ——– what is the name of that book anyone ?????? I think I have my facts straight, if not can someone please set me straight by sending me an email. The book in which Lucy is murdered is called “Friend of the Devil”! Love the books but struggle to watch the TV series where Banks is portrayed as such a dour man. He is not like that at all! I looked at the books in order because I wanted to read them from the start. I have a listing for a book called Caedmons Song, an Inspector Banks mystery?? I can’t find it in the list above so don’t know where it fits in. can anyone help please. last book Banks was getting married and had a baby, Noah. this next book Abattoir Blues he has an Italian girlfriend..
where are the wife and son????? will I know when I finish this book? You are getting mixed up with Peter James’ character,Roy Grace. I also was surprised that Annie and her Daughter Isla did not feature as Bankses new family in this latest story. (which is titled ‘In The Dark places’ in the US. What is the explanation of this? I kept thinking I must have missed a book. My feeling is that this latest story does not have the intrigue and ‘staying power’ of all the others. It is shallow and lacking in the interaction of relationships , both familial and professional, that we are used to in the previous novels. In my opinion the plot is thin and boring – the pothole scene, while producing a spark of inventiveness, has a very predictable outcome. I love the tv series and wish there were more. I especially appreciate the incredible landscape photography- brilliant! It gives great depth to the tv series. I think Stephen Tompkinson, while not looking at all like the description of Banks as a short dark haired Welsh man, plays the part perfectly. Annie having a daughter does not happen in the books, the TV writers created that. I think the DCI Banks is portrayed as too miserable in the tv show, I much prefer the books. I always enjoy Peter’s book, the Yorkshire settings are well and warmly depiceted. Iam very much looking forwards to meeting him in Malton on the 6th of next month and bying his latest book. Just wish his inspector Banks had been better representated in the t.v series. Well done Peter and many thanks.